The experience starts as soon as you arrive, when you are greeted by Southern belles at the front entrance and whisked back in time to another era. Then you&apos;ll spend some time enjoying the live bluegrass and country sounds of Mountain Ruckus in the Dixie Belle Saloon at no extra charge. Tap your feet and enjoy the saloon&apos;s selection of tasty snacks (popcorn and peanuts) and non-alcoholic beverages as you wait for the Stampede show to begin. Next, the saloon doors will swing open wide, and you&apos;ll make your way into Stampede&apos;s 35,000-square-foot arena, where you&apos;ll find your seats on either the North side or the South side. That&apos;s because Dolly Parton&apos;s Stampede pits audience members against each other in a very friendly Civil War-themed rivalry, and at least for the course of that show, you&apos;ll be cheering for either the blue or the gray. 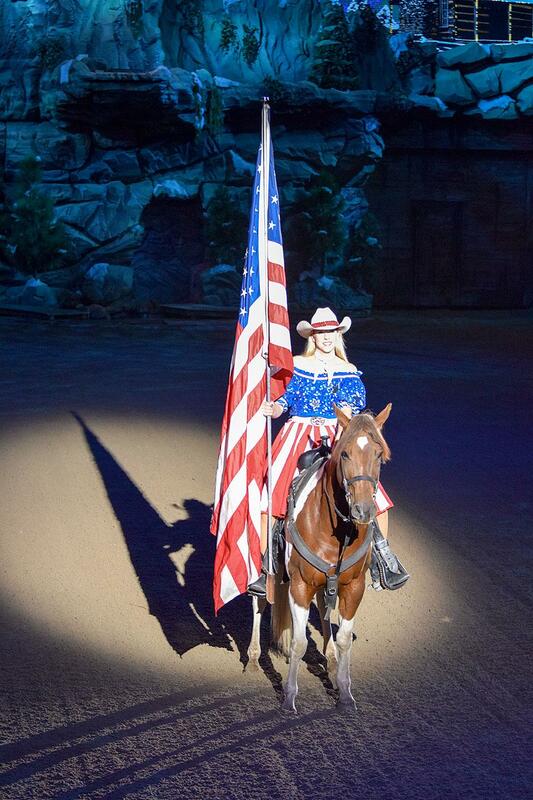 That rivalry is played out during the two-hour production by the stars of the show – 32 magnificent horses and their riders, who engage in a series of horseback competitions, stunts and trick-riding exhibitions. You&apos;ll enjoy watching horses run barrel courses or jump through a fiery ring, and at one point, horse-drawn buckboards race each other in furious figure eights around the arena floor. It&apos;s blue versus gray all the way in this multimillion-dollar show that also includes special effects, spectacular musical productions, audience participation, comedy and other animal acts, like racing pigs and doves of peace. It all leads up to a patriotic finale that unites North and South in a red-white-and-blue salute to America. And don&apos;t forget about the meal. Dolly Parton&apos;s Stampede is known for its four-course family dinner, which your servers (cast members dressed in either blue or gray Civil War uniforms) will begin serving not long after you&apos;re seated. The menu features a mouth-watering whole rotisserie chicken, hickory-smoked barbecue pork loin, Dolly Parton&apos;s Stampede&apos;s famous creamy vegetable soup (no, they won&apos;t give you the recipe), a homemade biscuit, buttered corn on the cob, herb-basted potato, a specialty dessert and unlimited soda, tea or coffee. Also, vegetarian meals are available on request. A note for you first-timers: Dolly Parton&apos;s Stampede doesn&apos;t use silverware, so you get to eat everything with your hands. But don&apos;t worry; the soup is served in a bowl with a handle, and they&apos;ll give you plenty of napkins. You&apos;re going to need them. Before you leave, you might want to browse their gift shop, where you&apos;ll find a wide array of souvenirs of your evening as well as the chance to purchase a photo of you and your party, which was taken when you first entered the building.